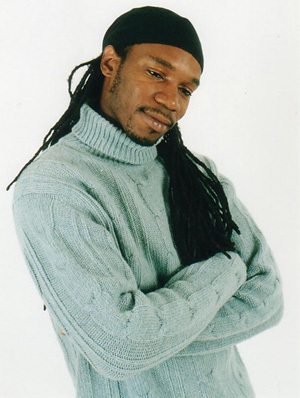 Ian Edwards, "British-born, Jamaican-raised, American-based dreadlocked comedian"(!) is one of the rising stars of the New York comedy circuit. American television appearances on Def Comedy Jam and the Apollo Comedy Hour have been the launching pad for the much travelled Comedian's performances at the Montreal Comedy Festival and in Stand Up Black America at the Edinburgh Festival. Ian's clever, often surreal humour is delivered in a dynamic performance style developed during an apprenticeship on the tough new York live comedy circuit, resulting in Ian writing for The Keenan Ivory Wayans Show. British television has already picked up on he rise of the UK's best comedy export, with Ian's guest spot on BBC2's sketch show The Real McCoy followed by regular appearances on Channel 5's late night stand up show Club Class. His latest UK television appearance is on Live At Jongleurs. Live, Ian has thrice toured the UK, headlining the New York Talk tour at major venues including London's Hackney Empire, Nottingham Playhouse and the Rep, Birmingham. Ian currently divides his time between New York, L.A. and London, spreading "dreadlocks and jokes"!